Christmas week. We’ve ‘Decked the Halls’ and I’ll bet many of you have your cookie trays all readied for the holiday festivities. My Grandson, the J-Dude, and I got down to the serious business of baking and decorating our Christmas cookies over the weekend. In between time, with so many choices and recipe variations these days, I’ve been enjoying seeing what others are making, including food blogger friends. Yet, even among the diverse choices and interesting ingredient selections, for me, my favorites are still Old Fashioned Sugar Cookies with Sprinkles, how about you? Wishing you peace and calm in the final moments of busy preparation, and lots of sweetness in the moment. Cream together the butter and sugar until light and airy, around four minutes. Sift together the already sifted flour, baking powder, and salt, then working in thirds add into the butter mixture incorporating well between each addition. Beat in the egg, Cointreau, and vanilla until well blended. Shape dough into a large disk, cut in half, shape each half into a round, cover with plastic wrap, refrigerate for one hour. Preheat oven to 350 degrees, line baking sheets with parchment paper or silpat. Remove dough from refrigerator and let sit at room temperature for ten minutes. One disk at a time, roll out to 1/8 inch thickness on a lightly floured surface, cut out shapes with cookie cutters, placing onto baking sheets one inch apart. 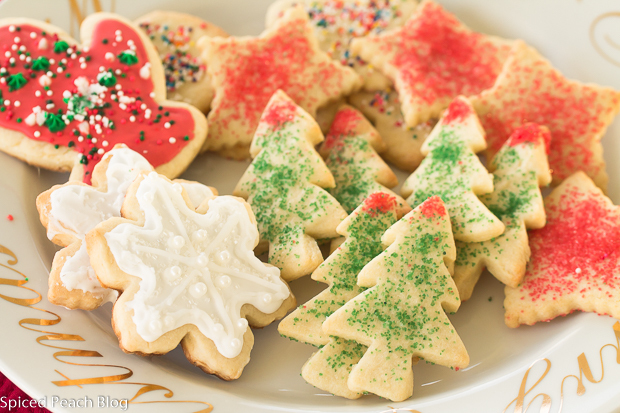 Sprinkle cookies with colored sugars or nonpareils. Bake for 10 minutes, do not let cookies brown. Cool on baking rack. This entry was posted in Holiday Favorites, Sweet Treats and tagged Old Fashioned Sugar Cookies, Old Fashioned Sugar Cookies with Sprinkles, Sugar Cookies. Bookmark the permalink. Post a comment or leave a trackback: Trackback URL. Those cookies look delicious; I can practically smell them from here. Merry Christmas to you, Peggy. Enjoy your time with J-Dude and all of your loved ones. Hugs to you. My Mom baked great sugar cookies at Christmas time, batches and batches. Then I inherited the responsibility and collected way too many cookies cutters which I used once a year. Now Melissa is the sugar cookie Mom with lots of help from her two girls. We preferred colored sugar sprinkles over frosting. Your picture brought back many nice memories, Peggy. The recipe looks like a good one. Have a wonderful holiday with your family. Hi Mary, Merry Christmas! Hope you enjoyed a fabulous holiday! Well, the sugar cookies were delicious and such fun to make with Jason. I prefer sprinkles to the icing as well since I think the icing becomes so hard making them more pretty but less delicious. Having done the cookies and a lot of cooking… I did not however, get out any Christmas Cards, I simply got too behind, not to mention I’ve not even opened all of them yet. Sigh. Talk to you soon and wishing you a fabulous remaining holiday season… and Happy New Year ahead! Big Hugs and Love Your Way! Love sugar cookies and ate a lot of them these past few days. Back to running! Phil recently posted…Christmastime Calamity and the Essence of Ecstasy! Merry Christmas and Happy Holiday’s to you and your gal Phil! I’m sure a few sugar cookies won’t hurt, and with your running! You’ve done an awesome job over the year and I’m happy that you are feeling great on the progress!